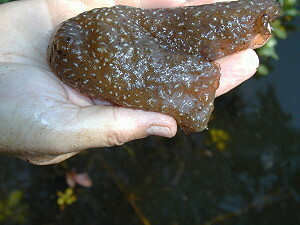 The large jelly-like blobs that you see in the water in the Bar-D lakes are moss animals called bryozoans. 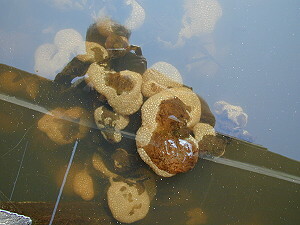 These colonial animals create cellulose "homes" in the water during the warm months of the year. Bryozoans build their cellulose homes on pier pilings, logs, and most any submerged structure in clean, somewhat clear water. 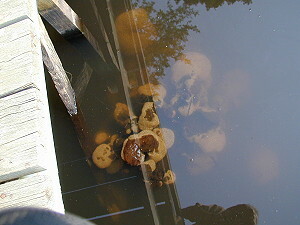 These blobs are not fungi or algae...they are condos for tiny filter-feeding animals. Bryozoans do not hurt the fish. These moss animals filter the plankton from the water. 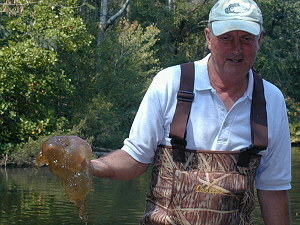 They are interesting and fun creatures of fresh and marine bodies of water. The white specks on the blob of cellulose are the individual moss animals. 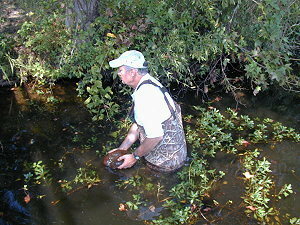 When the water cools in late Fall, the animals for tiny, dot-like cycts called statoblasts. The statoblasts sink to the bottom of the lake and remain dormant till the water warms in the late Spring. The statoblasts are embryonic moss animals. They grow into maturre individuals and form their cellulose condos. 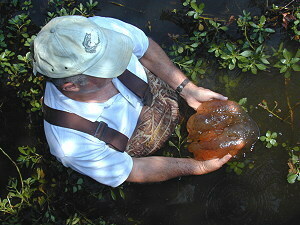 They live in these jelly-like masses till cold weather causes them to repeat the life cycle.